Combine World War Z and Mad Max and put it into a comic book without pictures and you get the fast-paced feel for The Change: Orbital. “The Change” came about suddenly, turning the world into an instantaneous post-apocalyptic, dystopian world. Howard wakes up in a car on a highway to discover the change and is confused by what he sees, and his surroundings. Nature has become cruel – with pigeons attacking like zombies – and men have formed scavenger gangs. Howard runs into an odd fellow who goes by the name of ‘Hubcap’ who brings Howard into the safety of his gang. But Howard has a secret that even he isn’t sure of. He has a very strong feeling that he and Hubcap are supposed to make a journey into another territory to explore what’s at the heart of this change. A dark blob of goo appears, gobbling down members of a biker gang. Howard and Hubcap must pursue Howard’s intuition. In many ways this is a pretty standard post-apocalyptic sci-fi story. Author Guy Adams doesn’t need to spend much time describing the setting or giving s a lot of background because most of us are already familiar with the genre and the look and feel of the world because we’ve watched The Walking Dead or the Mad Max films or any one of dozens of similar films. What the book has, then, that makes it a little more unique, is a mystery. This is not a survival at all costs story, there’s something afoot and Howard is a part of it, and that’s about all we know. Like comic books, or graphic novels, this appears to be written in serial style. ‘Book One’ really means ‘Chapter One’ of a larger story. There’s a good history of serialized fiction, especially among the British (thank you Charles Dickens!) and while I’ve more than once bemoaned the lack of ending in a book because of the attempt to get you to buy the next volume, thus lining the publisher’s pockets with your pennies or pounds, this feels a little different. First this is a short book. A novelette, perhaps? And it doesn’t try to pretend to be a complete book, which I think is the main difference. Going in to this you have a pretty good clue that you’re not going to get the whole story in this one volume. Still…I’m not a fan of leaving so many questions unanswered simply to sell another volume. The book loses one star for that. If you like the genre and don’t mind some familiar tropes in order to begin a mystery, then you might want to consider giving this a chance. It’s a quick read, so it won’t take up a lot of your time. Looking for a good book? 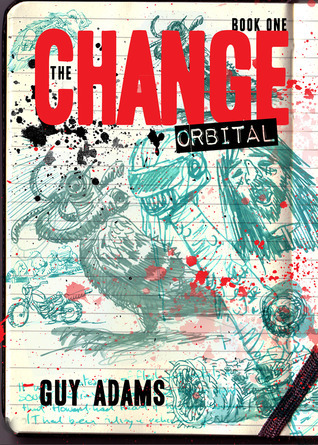 The Change: Orbital by Guy Adams is the first, slim, book in a series about a strange sudden change that came over the world, casting it into a dystopian wonderland where something dark and evil lurks at the heart of it all, but you may have to pay out for many more volumes before you get a better sense of the whole story.